The United States was founded on a set of beliefs and not, as were other nations, on a common ethnicity, language, or religion. Since we are not a nation in any traditional sense of the term, in order to establish our nationhood, we have to reaffirm and reinforce periodically the values of the men who declared independence from Great Britain and framed the Constitution. As long as the Republic endures, in other words, Americans are destined to look back to its founding. From the earliest days of the independent United States, Americans have looked back to its founding—to honor it and to define it for posterity. During the Revolution, countless addresses, sermons, and parades commemorated the Battle of Lexington and Concord, the signing of the Declaration of Independence, and other events of the nation's founding. As the contributions of the uniquely civic-minded men who formed the nation became widely known—and held in due awe—the nation began to commemorate its founders. We conclude this section, and this primary source collection, by looking at the earliest portrayals of the Founders, from the end of the Revolutionary War to the first years under the U.S. Constitution. How have the portrayal and commemoration of the Founders evolved over the centuries to our day? Overall, how were the Founders represented in the transitional period from 1780 to the early 1790s? How does each portrait exhibit the purpose for which it was painted? What is conveyed through pose, gaze, expression, demeanor, and costume? In its first decades, how did the nation envision itself through the depiction of its revered Founders? Which painting is most effective for you, as a viewer? Why? – Are the portraits by the same or different artists? – Are the portraits from life? – Why were they painted? – What was occurring in the person's life at the time of each portrait? Compare the Washington portraits (1787-90) in this collection with three earlier portraits (1779-85). How do they mark a transition from General Washington to President Washington? View and compare a wide selection of Charles Willson Peale portraits of American leaders [links below from multiple sites]. What is distinctive about Peale's portraits? What attributes did he strive to capture in his portraits? What attributes of Franklin were honored in the memorial tributes? What accomplishments? What was emphasized about Franklin as a man, a citizen, a pursuer of knowledge, and as a Founder of his country? In what ways did he model the ideal American citizen? How was the usefulness of his life emphasized (in addition to his serving as a role model)? How were his religious views described? his use of reason? What did you learn about Franklin from the reports and tributes? Why do you think Franklin's scientific pursuits were emphasized in the tributes? Why do you think his role as a signer of both the Declaration of Independence and the Constitution was unmentioned in the tributes? Why do you think his diplomatic achievements in Europe were underplayed in the tributes? To what extent did the 1790 Franklin tributes set a precedent for mourning the nation's Founders? Why did President Washington decide against directing the executive branch to wear official mourning (a black armband) for Franklin? Compare the tributes to Franklin—the first Founding Father to die—with those on the deaths of George Washington (Dec. 4, 1799), Alexander Hamilton (July 12, 1804), Thomas Jefferson (July 4, 1826), John Adams (July 4, 1826), and James Madison (June 28, 1836). How do the tributes exhibit the evolving image of a Founding Father? How have the portrayal and commemoration of the Founders, and of the nation's founding, evolved over the centuries to our day? To conclude this section—and this primary source collection—consider this statement by historian Gordon S. Wood in his Revolutionary Characters: What Made the Founders Different. Compose an essay, newspaper editorial, dialogue, political cartoon, drawing or other creation that distills Wood's point and conveys your interpretation of the Founders for our time. America's Founding Fathers, or the founders, as our antipatriarchal climate now prefers, have a special significance for Americans. Celebrating in the way we do this generation that fought the Revolution and created the Constitution is peculiar to us. No other major nation honors its past historical characters, especially characters who existed two centuries ago, in quite the manner we Americans do. We want to know what Thomas Jefferson would think of affirmative action, or George Washington of the invasion of Iraq. The British don't have to check in periodically with, say, either of the two William Pitts the way we seem to have to check in with Jefferson or Washington. We Americans seem to have a special need for these authentic historical figures in the here and now. Why should this be so?
. . . The identities of other nations, say, being French or German, are lost in the mists of time and usually taken for granted. . . . But Americans became a nation in 1776, and thus, in order to know who we are, we need to know who our founders are. The United States was founded on a set of beliefs and not, as were other nations, on a common ethnicity, language, or religion. Since we are not a nation in any traditional sense of the term, in order to establish our nationhood, we have to reaffirm and reinforce periodically the values of the men who declared independence from Great Britain and framed the Constitution. As long as the Republic endures, in other words, Americans are destined to look back to its founding. (New York: Penguin Press, 2006), pp. 3-4. 1Gordon S. Wood, Revolutionary Characters: What Made the Founders Different (New York: Penguin Press, 2006), p. 4. – George Washington, life portrait by Charles Willson Peale, oil on canvas, 1787. Pennsylvania Academy of the Fine Arts, Bequest of Mrs. Sarah Harrison (The Joseph Harrison, Jr., Collection), 1912.14.3; reproduced by permission. – Thomas Jefferson, miniature portrait (from original painted from life) by John Trumbull, oil on mahogany, 1788. Metropolitan Museum of Art, Bequest of Cornelia Cruger, 1923, 24.19; reproduced by permission. 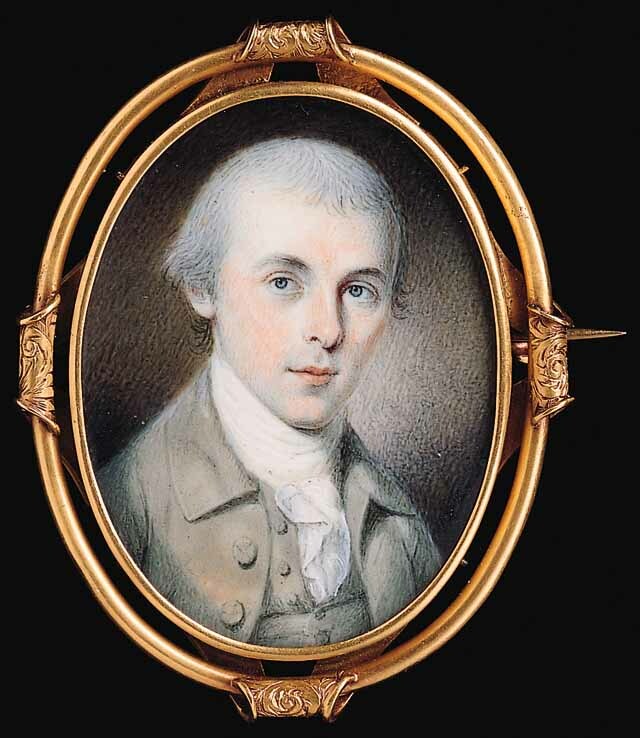 – James Madison, miniature portrait from life by Charles Willson Peale, watercolor on ivory in gold case, presented in velvet-lined container, 1783. Courtesy of the Library of Congress, Rare Books & Special Collections; photo: LC-USZC4-4097. – Alexander Hamilton, life portrait by Charles Willson Peale, oil on canvas, ca. 1790-1795. Independence National Historical Park, INDE11877; reproduced by permission. – Benjamin Franklin, life portrait by Charles Willson Peale, oil on canvas, 1785. Pennsylvania Academy of the Fine Arts, 1912.14.2; reproduced by permission.